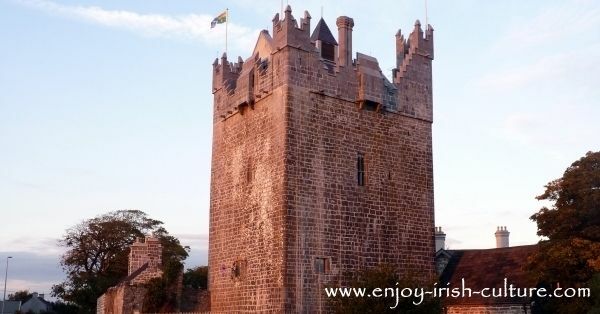 One of the most important medieval castles of Ireland, Claregalway castle is an imposing 15th century Norman tower house in County Galway which is located on the outskirts of Claregalway right on the main N 17 Galway to Sligo road. In the days of medieval siege warfare, the castle was of huge military importance for the entire area. Claregalway was a good access point for Galway. On this page I want to give you a brief glimpse into some crucial moments of this Irish castle’s history. One of the best restored medieval castles of Ireland- Claregalway Castle, located directly on the N17 Galway to Sligo road. Who Owned This Castle In Medieval Times? Claregalway Castle was one of four castles owned by the De Burgos, a Norman family who later anglicized their name to Burke. The branch of the family living here were descendants of Richard De Burgho of Connacht. Different members of the Burke family lived here throughout the ages. How Old Is This Castle? According to archaeological findings, the vaulted ceiling of the ground floor was constructed in and around 1408. However, more than likely, there was a different, older structure in the same location before this present castle was constructed. The higher floors of the castle were dated to the 1440ies. Looking at the stone work styles in detail archaeologists were able to tell two distinctly different styles. The belfry tower of the Franciscan Friary across the main road in Claregalway was built in the 1430ies. It shows the same two patterns in the stone work, which means that the castle and friary were built by the same stonemasons, or by the same guilds. The battle of Knockdoe took place near the nearby village of Lackagh in August of 1504. This was a major battle between two Norman families, the De Burghos and the Fitzgeralds where thousands of soldiers, mainly Galloglasses (hired mercenaries) died on both sides.The two families had been at conflict for both private and political reasons. The De Burghos were gaelicised Normans who did not speak English, where the Fitzgeralds had strong links to England and the powers that be. The Fitzgeralds wanted to gain dominance in these parts, and winning this particularly violent battle at a high cost, they did. They proceeded the following day to loot Claregalway Castle and to take the three children of Ulick Burke hostage. The method of taking children hostage and raising them as your own was used in medieval times to re-establish peace and assure future loyalty by the defeated clan. Later the castle fell onto Phillip De Burgho. Phillip de Burgho was one of the great Irish lords of the 16th century. He went to London to meet Henry VIII. Although his family were loyal to the English crown, he could not speak English, but his latest wife is said to have taught him enough English to get by in court. Henry VIII and Phillip De Burgho had a lot in common as both were harpists. The king was very impressed with De Burgho, and, in blood, drew a lion on his chest. 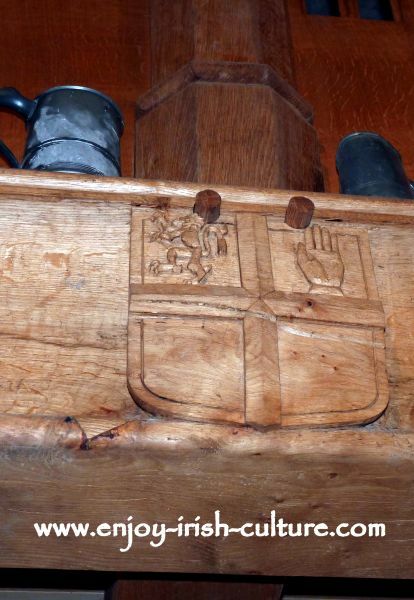 Ever since, the lion has been part of the De Burgho family crest. 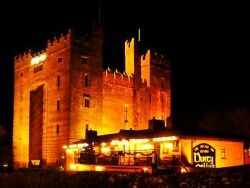 Henry VIII also gave him a present of an Irish harp which came back home with him to Claregalway Castle and was probably kept here for some time. These days, it is displayed at Trinity College, Dublin as ‘The Irish Harp’. It was one of the few harps to survive the English purge of Irish harps. Unfortunately De Burgho contracted a fever when staying in London, and died of it a year later. When all his children from different marriages grew up, everyone wanted part of the inheritance. The following saga of the sad 1571 siege was part of the resulting piece of the castle’s history which reflects the constant turning of tides in the history of the medieval castles of Ireland. 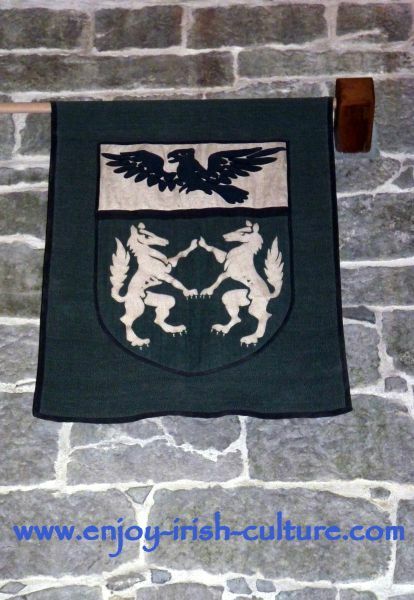 In 1571 John Burke, who was an illegitimate son of the lord took Claregalway Castle by force with a crew of 16 men. Their defense strategy was to uncover the roof of the castle and all surrounding buildings so that they could not be set on fire. It is from the records of this siege that we know that the roof of Claregalway Castle was thatched back then. John Burke and his men were successful in defending the castle for quite some time. Eventually the Burke clan called in artillery from Limerick to help suppress them and as the first shots were fired at the castle from across the river they surrendered. They were all hanged somewhere in the bawn of the castle. The siege of Galway by the Cromwellian forces which started in August 1651 was orchestrated from Claregalway Castle. Galway was the third last town in all of Ireland, Scotland and Wales to be taken by Cromwell. The siege lasted 9 months. The old castles of Ireland located in strategic places, like Claregalway Castle, played an important part during this war. Claregalway Castle was captured by Cromwellian forces and was used as a headquarters by Sir Charles Coote and his troops. The officers stayed in the castle building itself, while the soldiers stayed in the bawn. After this episode the castle became a garrison for English troops, as was the fate of many historic buildings and castles of Ireland. 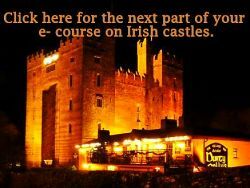 Find visitor information and our opinion about the castle visit here. If you do like what we do, why not tell your social friends so that they, too may find us and enjoy our content. Your support would be much appreciated! There are social options both at the top left and at the bottom.